Wow its been so long since our last post. I really hope everyone made it to the flip side of the holidays safely. We have been getting a lot of gloomy, wet and COLD weather. Just the right combination to keep us hibernating like two old grumpy bears. We did manage to climb out of slumbers on the very few sunny days we were blessed with. We had a great opportunity come up and we decided to take it. We have been extremely busy with the hunt for our new homestead. Its been an enormous task sorting through all these properties trying to find just the right one to meet our needs and in our budget. We have been exhausted. We have switches and outlets in place! 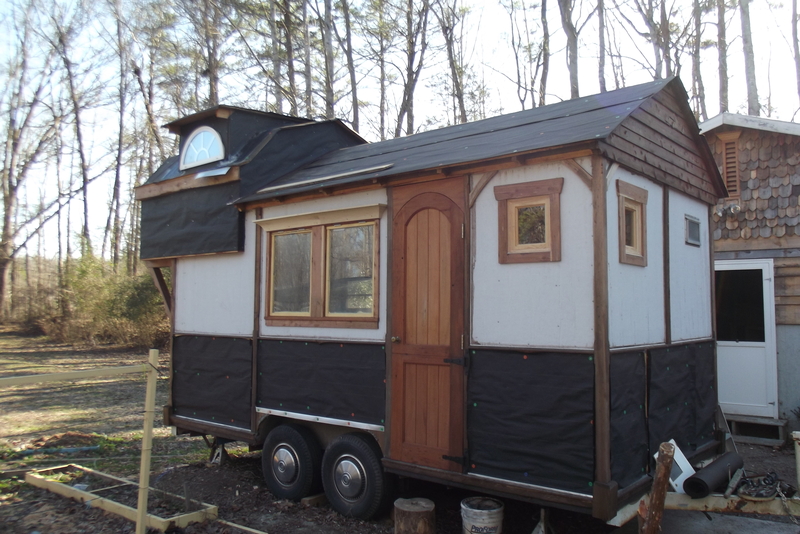 We did however did manage to squeeze sometime in and get some work done on the tiny house. I must say, building this house from scratch has been a true learning experience. You can plan and plan but not really know exactly how its going to come together until you’re doing it. This brings me to the electrical work we just installed.. 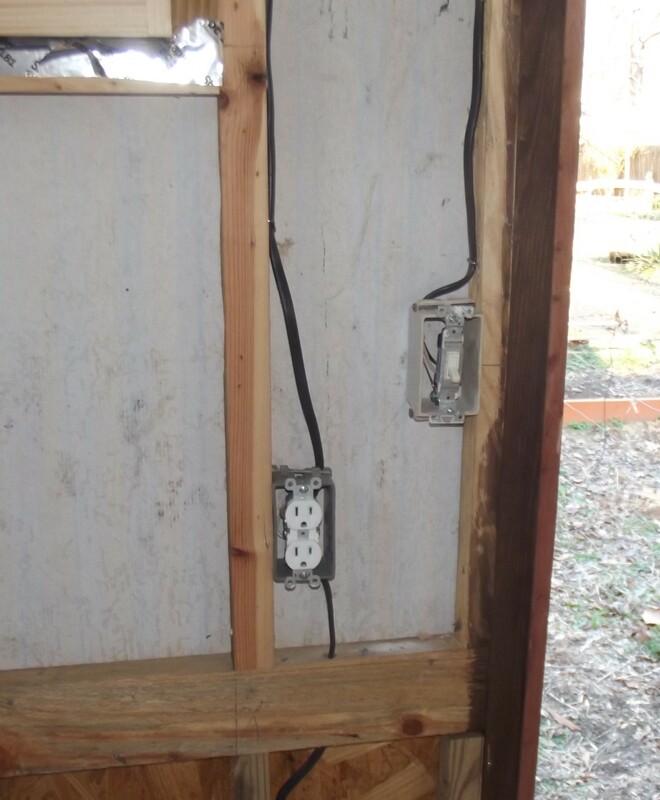 I had to finally decide where I wanted outlets and switches. I had given it some thought through this entire project but never that much thought. I had no finger nails left after it was all said and done. It was a daunting task but hopefully what we chose will be what we need when its all said and done. It will be nice to finally be able to install some unique light fixtures that I plan to hang just as soon as I stumble across the perfect ones for that perfect price. Hopefully free. Dave’s got it wired I just need to find them. The vintage cushion will be reupholstered in the near future. Its from the original camper. We have made some more very permanent decisions also. 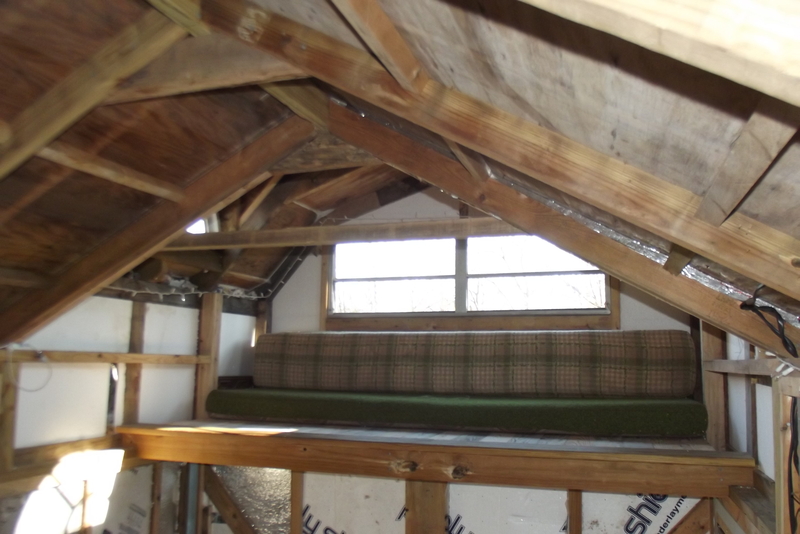 That was just the freshest in my memory.We have started insulating and the loft is in. The headroom is amazing thanks to Dave’s creative thinking! The front door has been dry fit into place and is a perfect fit. Windows are installed. 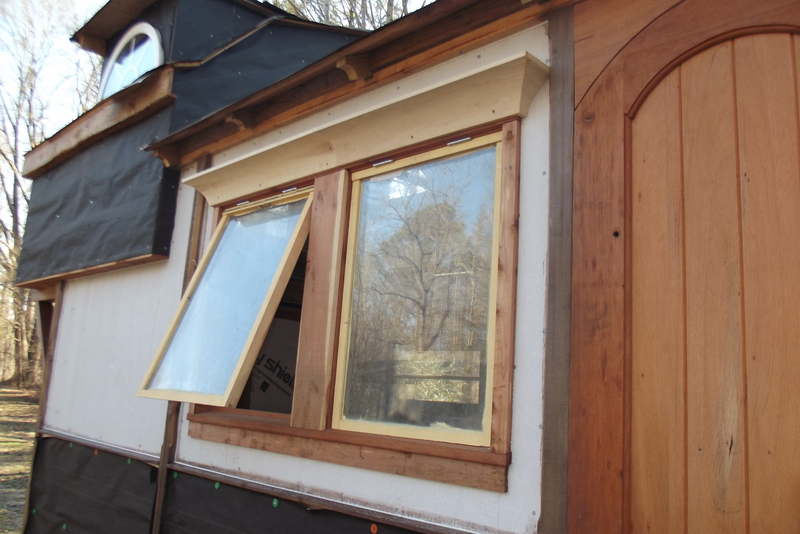 We have got her completely in the dry, Some of the outside window trim has already been installed. Our built-in coach/bed in the living space is built and installed. Which has been wonderful to finally feel how spacious it really could be for two nature loving nerds. . The most valuable thing I have learned from it is, You may not know how you are going to do something but if you continue to believe in yourself and your dream. Even when others might not. You will make it happen some how. It is still so mind blowing to me every time I realize just how far we have come due to our thriftiness, creativeness and teamwork. Hopefully we can apply the same technique and find that perfect homestead to park our home. In the mean time please say a prayer for us and we will keep our fingers crossed. 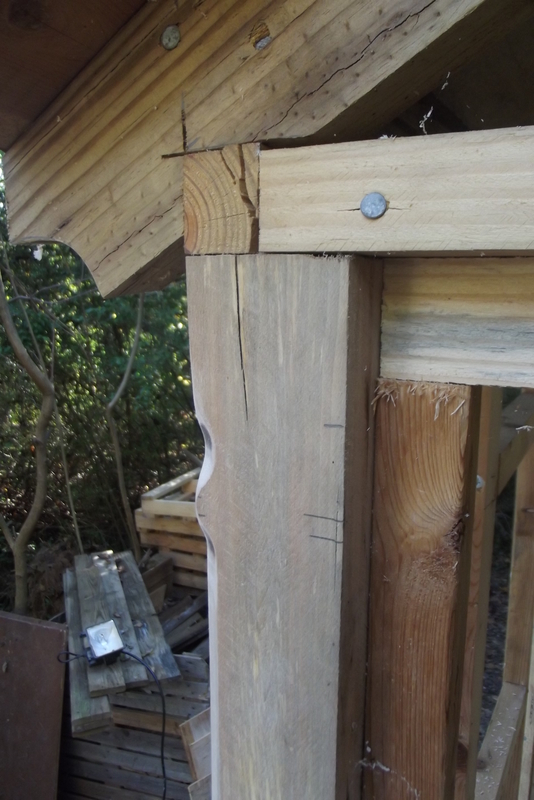 I want to write a little about a detail I added to the corner posts on the front corners. It mimics a detail I saw on a piece of seventeenth century furniture. I know it as a Lambs Tongue Chamfer. I made these with nothing more than a handheld router fitted with a 45 degree chamfer bit. I picked a place and marked the top line, an inch below that line I placed another mark, and another mark 1/2 ” below that one. A friend gave me a few pieces of a beam that was removed from the roof of a local warehouse facility some years back, They were covered with a few thick coats of paint but i knew underneath that there was some wonderfully beautiful Mahogany. Here in the photo below, they are sitting on the table saw ready for their beauty to be revealed. The first pass on the Ridgid granite top table saw. This saw is the heart of our small shop. It was purchased as a closeout sale item,for around five hundred bucks, and it has been worth every penny. It really is a work horse.We have owned it now for five years, We have adapted a Jet 52″ rip fence to fit this saw and built a outfeed table that also serves as the main workbench in our shop.